I wanted a simple web client to access my mobiles and tablets from my PC. I found and adopted Mobizen. From a feature perspective, I was simply looking for something similar to the Google Chrome Remote Desktop or the Microsoft Remote Desktop but, if possible, without the need to install anything on the PC; i.e. : a purely web client mirroring an Android screen . I did test first AirDroid which is great, advanced, quite complete from a feature perspective. But first, it's a bit too complex to "simply" remote access Android and next requires to install. I tried next Mobizen. This one is not as complete as AirDroid which comes with its own interface to access SMS, calls, files, photos, videos, contact, ..., without the need to use the full remote access (mirroring the screen). But some of the missing features in Mobizen are already available in Beta. Here is what the remote access to my Galaxy S7, from Chrome, looks like. It requires an App on the Mobile: Mobizen mirroring. Nb. :A dedicated version exist for Samsung. Next to that, I am also using TeamViewer, which is great as the same product can be used in both direction. I.e. 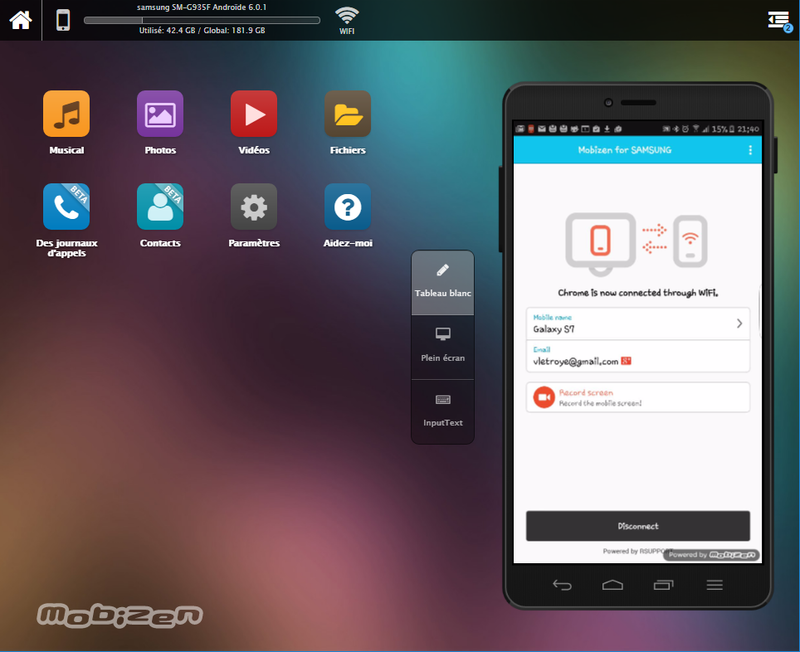 : with the TeamViewer "host" App for Android, PC's can remotely access mobiles and tablets. And with the TeamViewer "for remote control" App for Android, mobiles and tablet can remotely access PC's. TeamViewer is my favorite free application (for non-commercial use) to remotely access my PC and home servers from anywhere (I.e. : Internet). With TeamViewer, instead, I log onto there website with my account and see a list of my machines. I simply click on a machine in the list, "et voilà"... from a single location, easy to remember, I can get remote access to the desktop of any PC at home or transfer any files from those. Even better, it supports remote desktop on PC with mutliple screens. And finally, I can also print any documents from my home machines on the printer next to me (e.g. : at the office). For sure, the machine to be accessed must be up and running and TeamViewer must have been previously installed and configured to authorize unattended remote access (with a password). To be noticed: TeamViewer may not be installed without a licence on a Windows Server. A Server is assumed to be for "commercial" use. That's a pity as Windows Home Server is clearly a Server for personal use only... If you try to install it, it will not let you choose the "free-flavor" setup... Interesting to note however: "Ninite", which is a free software used to silently download, install and update softwares, is actually able to setup TeamViewer on Servers too, in the free-flavor (the only inconvenient is that TeamViewer does not appear on the Start Screen and is not searchable from the Charm Bar. I didn't succeed to connect to my Server 2012 Essentials through Remote Desktop until I remembered me that this one was set up by default as a domain controller, one of the major differences between this server and WHS 2011. Allow remote connection to this computer. Next, I have disabled the Firewall, I don't need to allow Remote Desktop Connection as an exception in this firewall. Finally, Windows Server 2012 Essentials being a domain controller, accounts created on that machine belongs to the domain defined at the end of the installation. So, the user name to be provided in Remote Desktop must be like <domain name>\<user name> instead of simply <user name> (equivalent to <remote machine name>\<account> as by default, Remote Desktop uses the target machine name as domain name). This subtle difference between Server 2012 Essentials and WHS 2011 (which was not a domain controller) could be a source of confusions while trying to connect for "end-users" used to work with workgroups instead of domains. I was trying to remotely connect from a Windows 7 to a Windows 8 where I was still logged with my Windows Live account. As I am still quite new to the use of Windows Live accounts, I was unsure about what to provide as credentials. For sure, to remotely connect on Windows 8 with a Windows Live account, it's the related emails that must be typed in the Remote Desktop's login prompt. I was hesitating because, although the account name is the Windows Live email, the "user" folder name is only the name part of this email. While checking which credentials to provide, I found by accident a way to get access to the logon screen of the remote machine, where the user currently logged appears => no need to remember the account name at all in this case :). I did run the command "mstsc -v:<machine name>"
I did use another account: "<machine name>\administrator" without password (I don't know it anyway). I was next presented with an error message: "The username or password is incorrect" on logon screen of the remote machine. I did click OK. I did click on "Switch user", the left arrow on the top-left side. Run the command "mstsc -v:<machine name>"
Select Use another accountand type your Windows Live email as a user name. The domain displayed will be the one of your email. Notice: I was able to remotely connect to Windows 8 because the Firewall was off. Otherwise I would have had to enable Remote Desktop as an "allowed apps". On the Start Screen, type "Firewall" and select Settings to find it. click Allow an app or feature through Windows Firewall. Click Change settings if enabled (You might be asked for an admin password or to confirm your choice). Under Allowed apps and features, select the check box next to Remote Desktop, and then use the check boxes in the columns to select the network types you want to allow communication on (should be private for your intranet).